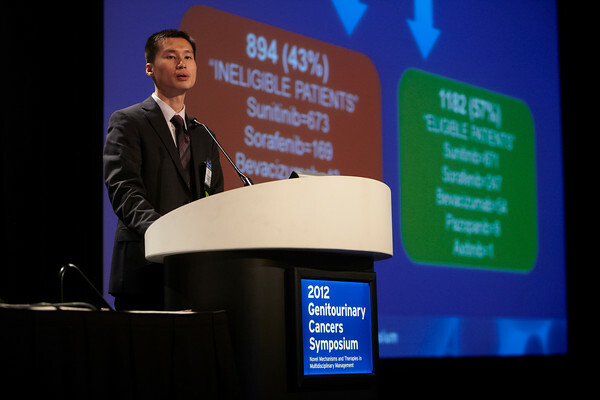 San Francisco, CA - 2011 Genitourinary Cancers Symposium - Daniel Y. Heng discusses his Abstract #353 A multicentered population-based analysis of outcomes of patients with metastatic renal cell carcinoma (mRCC) that do not meet eligibility criteria for clinical trials during the Oral Abstract Session C: Renal Cancer at the 2011 Genitourinary Cancers Symposium (GI) meeting at the Marriott Marquis here today, Saturday February 4, 2012. A record 2500 attendees from around the world were on hand to learn the latest treatment and research in Genitourinary cancers from fellow physicians, researchers, health care professionals, cancer survivors and patient advocates. Photo by © ASCO/Todd Buchanan 2012 Technical Questions: todd@toddbuchanan.com; Phone: 612-226-5154.